Despite previous reports that Disney couldn’t capitalize on Marvel attractions at their Orlando theme parks, The Walt Disney Company has confirmed that a Guardians of the Galaxy attraction will be making its way to Epcot. 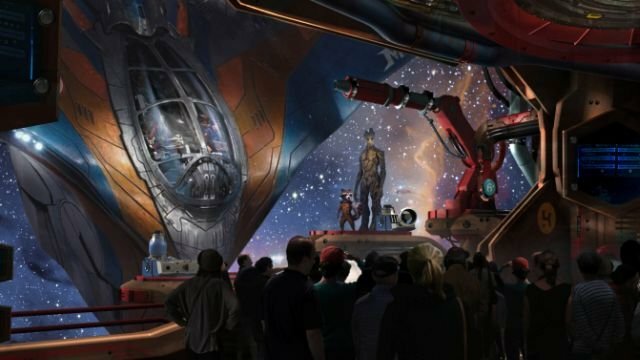 The Guardians of the Galaxy-inspired attraction will be added to Future World, adhering to the original vision of Epcot’s Future World as the place to experience the excitement and adventure offered by space travel. Epcot’s brand new E-ticket attraction will be based on the rockin’ and action-packed world of Guardians of the Galaxy and is the next step in how guests can encounter these characters at the Walt Disney World Resort. Epcot just may be the perfect place for a Guardians-inspired attraction as you can see in the photo below – Peter Quill (aka Star-Lord) actually visited Epcot as a kid! This new attraction will replace the current Universe of Energy attraction, which will close August 13, 2017. Second, a Disney•Pixar’s Ratatouille-inspired attraction will also be added to the France Pavilion in World Showcase. The attraction will expand the pavilion. Similar to the 4-D attraction Ratatouille: The Adventure that opened at the Walt Disney Studios Park in Paris in 2014, guests will be able to shrink to Remy’s size and scurry to safety in a dazzling chase across a kitchen with the sights, sounds and smells of Gusteau’s legendary Parisian restaurant.